Will the Yanks run the Rebels out of town? 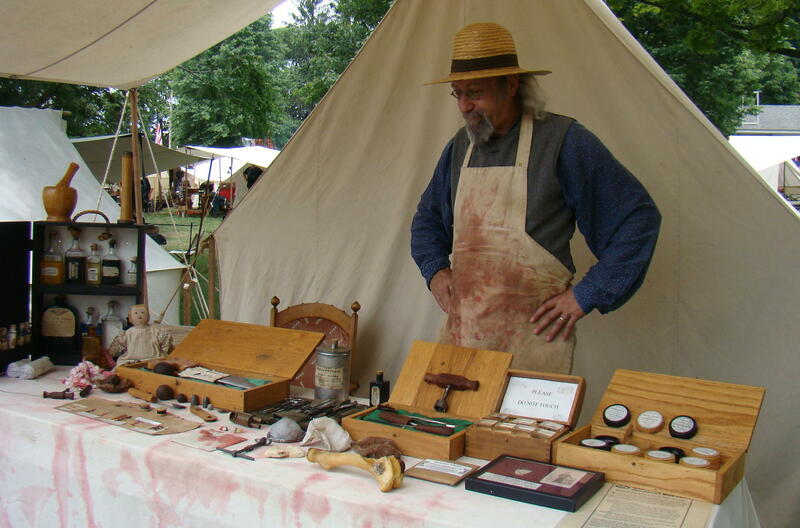 Reenactors lined the streets of McConnelsville, Ohio for their 25th Annual Civil War Encampment Days, Ohio’s longest consecutive running reenactment. What a great place to observe the living history of the Civil War. Everyone dressed in period costume in the soldier camps seemed eager to discuss their life style, and patiently answered all questions. Their canvas tents provided great cover from rain storms. However, they reminded those in attendance that it was important not to touch the canvas with your fingers during a rain. Seems the oil on your fingers would make the canvas leak. Rains were important for their War Gardens, which provided food for the army as well as land owners. Since death was frequently a visitor during this time, ladies told about the cemeteries where they often held picnics. Union stones were flat so you might sit on them, but the Confederate stones had a pointed top so “Yankees” couldn’t sit on their tombstones. The ladies also mentioned that black wreaths were hung on doors when someone died as a notice of death, since it was the only method of letting the neighbors know. Many medical treatments were explained by the blood stained Head Surgeon of the Confederate regiment. When asked what might be used to help a headache, the major informed visitors that opium would be used if it was severe, while a relaxing morphine or sassafras would be used for minor headaches. If the headache was too bad, they would just bore a hole in the head to release the evil spirits. Upset stomachs were treated with licorice or ketchup, and beef extract provided a soothing soup for many ailments. They even had a hollow doll that was used to smuggle medicine through the opposing lines. Later in the afternoon at the field hospital, the surgeon cured a case of gangrene and subsequent blood poisoning by sawing off the leg of the victim. Walked down to the Courthouse for “Squirmish on the Square”, where a staged battle occurred between soldiers from the North and South. Much ceremony was involved in the presentation of the battle both before and afterwards. There was even a bit of humor thrown in as they robbed a Wells Fargo box and then blew it up. The closing ceremony showed soldiers from both sides presenting arms, taps were played and a wreath was placed on the Civil War Private monument standing in the center of Main Street. The base of this monument is made of stone from Gettysburg and the Gettysburg Address is engraved on one side of the monument. After a hot afternoon on the square, it was time for a drink. 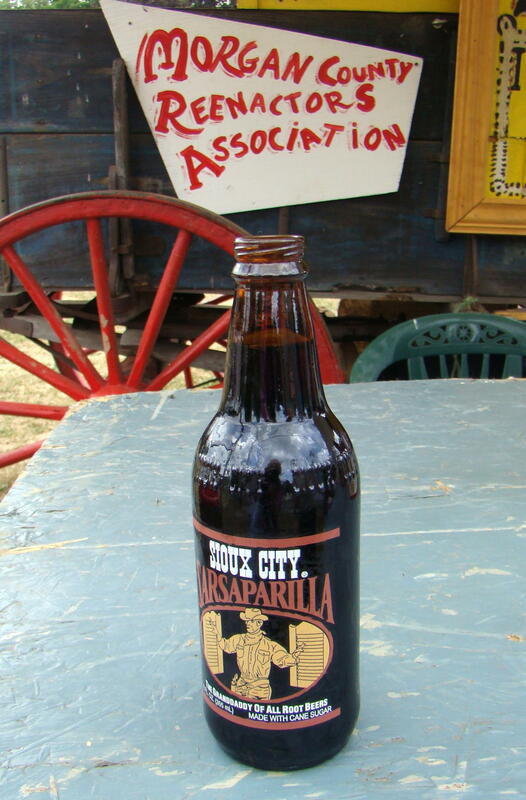 As Yosemite Sam would have said, “Sasparilly, and make it snappy!” Sarsaparillo was a popular drink of the Civil War era and a cold bottle hit the spot. Made from sarsaparilla roots, this drink is called “The Granddaddy of All Root Beers”. Originally the bitter root brew was used for medicinal purposes treating digestive problems, but later sugar water was added to make it more palatable. ..and a soft drink was born. 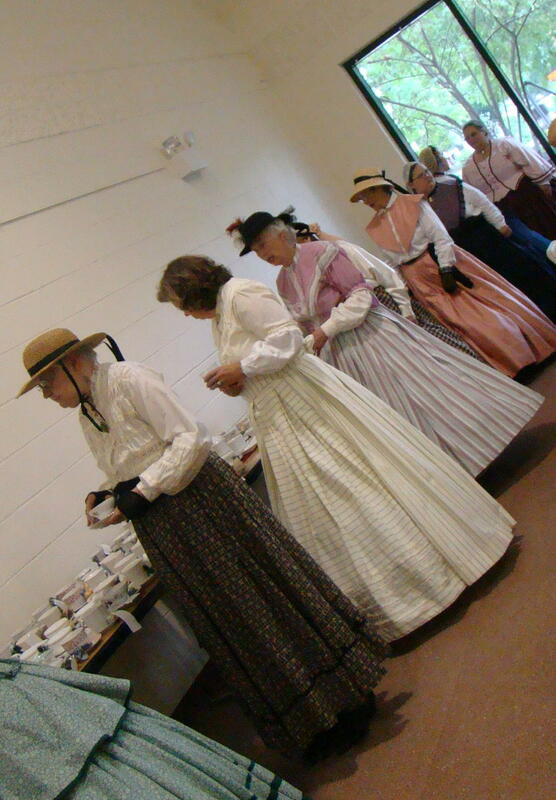 Ladies’ Tea was served amid beautiful hooped gowns and lovely flowered hats. Cucumber sandwiches, fresh fruit, and small cakes were part of the traditional menu. After tea, Verna Owens of St Mary’s, West Virginia told tea drinkers about Women During the War…from the Confederate viewpoint. Her leader was President Jefferson Davis, who had his Confederate White House at Richmond. She described the proper dress and manners for a Southern lady, who always carried a parasol and wore a hat. Her cooling fan accomplished an additional task as a means of expressing her thoughts without saying a word. For example a fan closed in a snap meant she was angry with what was being said, while fanning quickly might mean she couldn’t believe what was happening, or as we might say, “Oh, my!” Many toys of the time were explained and on display. Quiet dolls for church were made out of handkerchiefs, and there was a cow’s jaw for musical entertainment. When soldiers were leaving for battle they gave their sweethearts a tear bottle to collect their tears while they were gone. Upon their return, they hoped to find it at least half full. Verna closed by saying one truth learned from the war was that we definitely should learn to get along. 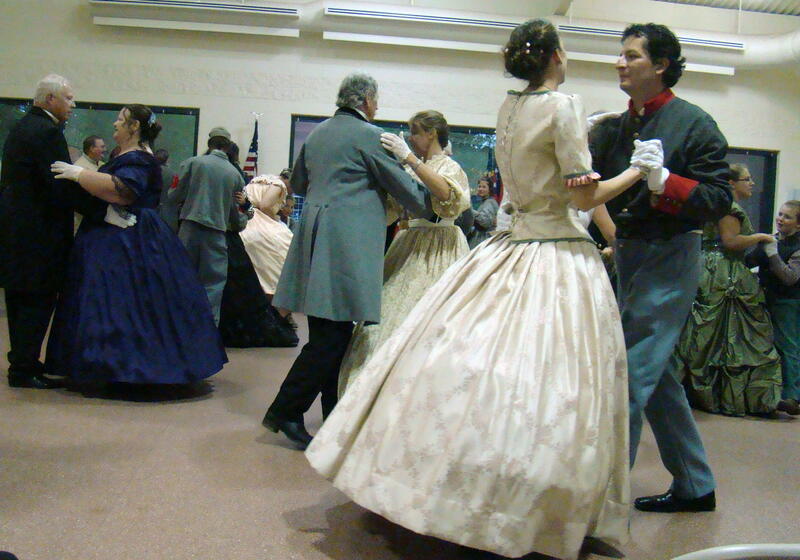 In the evening, a Civil War Ball captured the beauty that sometimes appears in the midst of turmoil. Ladies were dressed in their finest, but few hats were worn to the ball…just ribbons or flowers in their hair. Some men wore their uniforms while others were dressed in their best tailcoat. Dancers swirled around the floor doing The Promenade, Waltz, Virginia Reel, and Patty Cake Polka with music provided by Back Porch Swing Band. What a great ending to a Civil War Day. This particular Civil War Encampment occurred in McConnelsville, Ohio which is just South of Zanesville, Ohio on Route 669 following the beautiful Muskingum River. Located riverside just north of town is The Boondocks, one of Ohio’s best small-town eateries being featured in many magazines across the state. Their specialties are their award winning BBQ as well as their great and friendly service. Could be worth a Sunday drive for a nice meal even if there isn’t an encampment happening!